The processes leading to the many different illnesses that can affect people’s psychic equilibrium are still hotly debated. Often, these processes involve multiple contributing factors, which is why there are so many different hypotheses about them. In the case of depression, for example, one of the best known is the monoamine hypothesis, which associates the disease with underactivity of certain neurotransmitters. such as serotonin. Two Systems of Thought in a Single Brain? In the early summer of 2010, five neuroscientists spent a week all on their own, rafting and camping along the San Juan River in a remote area of southern Utah, in the United States. Nothing so special about that—plenty of people make these kinds of wilderness expeditions nowadays. Research on human memory is such an important aspect of cognitive neuroscience today that a tremendous number of articles about memory research can be found on the Internet. So this week, I am continuing last week’s list of new links to articles about various aspects of how memory works—one of the sub-topics covered under the topic Memory and the Brain in The Brain from Top to Bottom. For each link, I provide a brief description of the article in question. 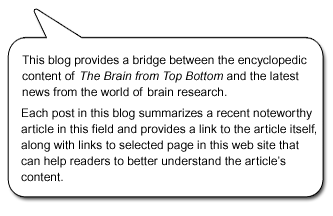 This week, as I have before in this blog, I am posting a set of new links to other web sites that discuss a subject covered in The Brain from Top to Bottom. For each link, I also provide a brief description of the content on the site in question.